If the idea of creating a strategic plan seems overwhelming this article from blue avocado provides some alternative methods for making decisions and moving forward, http://www.blueavocado.org/content/alternatives-strategic-planning. Organizational assessment tool that has been designed specifically for Friends organization. Grab a pencil and take this assessment. This organizational assessment tool is a learning instrument to help you understand where you organization stands in critical areas of organizational infrastructure and functioning. Audit Guide for Audit Committees of Small Nonprofit Organizations is a free resource provided by the Virginia Society of Certified Public Accountants. An Audit Worksheet for small nonprofits to review financial records. BoardSource provides practical guidance to board members understanding their responsibilities and the adequate protections they need to take. BoardSource has created a matrix to help you determine your board’s current skills and assets along with any gaps. This is a great tool for identifying the skill set you are looking for in future board members. Is it time to evaluate your board skills? This is a one-page tool to assess your knowledge, participation, time commitment, and constraints. Board Recruitment Handbook from the Center for Nonprofit Excellence. Guide to Board Roles & Responsibilities from the Center for Nonprofit Excellence. The budget timeline for the Refuge System has been diagrammed by the National Wildlife Refuge Association.This timeline illustrates the Fish and Wildlife Service and Department of the Interior budget process along with potential Congressional actions. While written for nonprofit board service in Washington state this guide offers board members everywhere valuable help in understanding their responsibilities as stewards of their organizations. Understanding the board roles and responsibilities is key to a successful organization. BoardSource has created a one-page checklist so boards can remind themselves of their responsibilities. 48-page IRS publication that provides comprehensive guidance on compliance. On rare occasions a board member needs to be removed for disruptive, destructive or demoralizing behavior. This Blue Avocado article offers four ways to accomplish this task. The guidebook is meant as a checklist of matters for you to consider and questions for you to ask as a nonprofit board member. Sprinkled throughout the book are pointers describing “good practices” for nonprofit boards, along with examples drawn from the experiences of other nonprofits. Often this guidebook will urge you to adopt formalities that you might find excessive. Two-page word document addressing how to get new board members involved. This site is well worth the look, http://www.councilofnonprofits.org/resources/leadership-development-and-succession. A 60-minute webinar from 4Good addressing how to maintain your tax-exempt status. A meeting minutes template for note taking, recording decisions, follow up items and other info. It may be customized and filled in electronically if desired. Reinvigorate you current board members with these nine practical steps. Just click on download for this article from IdeaEncore. 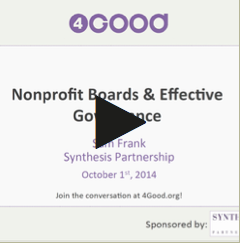 Specific tools and resources that will increase board effectiveness. The National Wildlife Refuge Association has joined the Nonprofit Risk Management Center (NRMC) as an Affiliate Member to help Friends groups manage their risk and understand their insurance needs. The NRMC specializes in providing risk management tools, advice, and materials to thousands of nonprofit organizations across the country. The NRMC’s Affiliate Membership program entitles affiliates of the National Wildlife Refuge Association to practical risk management resources, including more than 100 informational webinars and the NRMC’s Risk Help service. The National Wildlife Refuge Association receives numerous requests for information on insurance coverage. The following is intended to outline the types of insurance available to protect against the various risks confronting the Friends group community and to serve as a starting point for exploring and answering those questions. Do you have a board member recruitment process in place? BoardSource has a topic paper that discusses the components of a strong recruitment process. To download this paper click here. Sample Conflict of Interest Policy. A sample policy that outlines how organizations should manage documents. Sample Executive Compensation and Review Policy. Two-page word document that is a sample Whistleblower Policy. Center for Nonprofit Excellence has Board Transformation Toolkits for board members to learn new skills, reflect on their strengths and plan steps to become even stronger. The COMPLETE guide to starting and sustaining a Friends Group! BoardSource’s offers a series to help board members, chief executives, and senior staff understand the fundamental elements of service common to most boards for 20+ years. The second edition of the series is now available in PDF. Purchase the six books now. Ellis Carter is a lawyer who exclusively represents tax-exempt organizations, she has summarized some of the most common governance problems, from a lawyer’s perspective, here. This work is from 4Good and licensed under a Creative Commons Attribution 3.0 United States License. Venable LLP offers information to nonprofits on copyright and trademark. Click here to access this valuable information. Where and When should your board meet?